I'm sure you've heard the term "gentrification" used in describing the current state of affairs in Chinatown. Yes, it is pretty sad to see the place transition from the bustling place of the 80's into more of a hipster hangout. 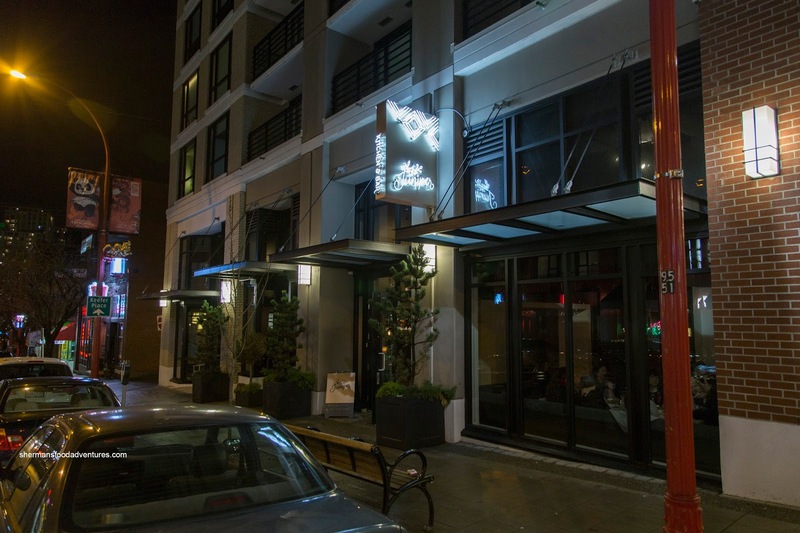 However, Richmond has really taken over the top destination for Chinese eats and shopping. Besides, there are pockets all around Vancouver one can buy their Asian groceries including several T&T's. For me, I believe that one cannot stop what happens organically, so I've tried to visit all of the great places to eat and drink in the area. 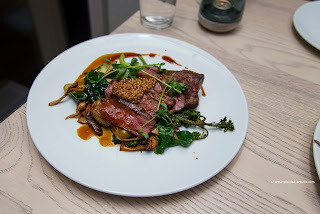 This food adventure (and drink adventure) finally brought us to Juniper. To begin, we had to go for what Juniper is best known for - their cocktails. Viv went for the Juniper made with Aviation gin, juniper berries, lemon peel and Fentimans tonic. As expected, this was a super refreshing and light cocktail. There was only a background lemon rind essence while the berries were nice too look at but hardly noticeable. 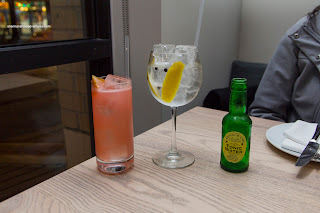 For myself, I had the Gin Grapefruit Mule consisting of Beefeater Gin, grapefruit, lime, ginger beer, Campari and bitters. Again, this was also light and fruity with only slight bite from the ginger. The tart and bitterness of the other ingredients came through, but it was well-balanced. 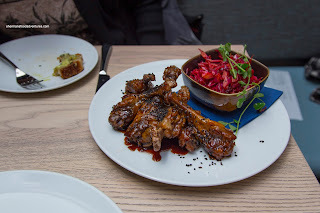 Onto the food, I was really interested in the Duck Wings that were confit and smoked. Hence, the meat underneath was soft albeit somewhat dry. However, the ample amount of honey sesame sauce spiked with whiskey kept things peppery, sweet and sticky. The smokiness was apparently while not overpowering. The side of tangy and spicy cabbage was impactful enough to stand up to the sweet wings. 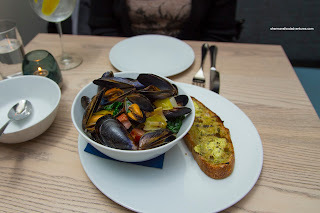 Next up, we had the Mussels with apple cider, boar bacon, grilled leek, kale and jalapeno buttered bread. The buttery and plump mussels were prepared expertly where each and every one of them were open. Bringy and sweet, the broth had a balancing amount of salt. The side of jalapeno buttered bread was sinfully tasty and we wished there was more of it. Prepared a perfect medium-rare, the flat iron steak in the Beef & Broccoli was tender in parts while a bit chewy in others. It was mildly meaty with the sweetness and slight tang of the pickled mustard seed on top. The fingerling potatoes were nicely roasted being soft while not mushy. I thought the lobster and oyster mushrooms were on point. 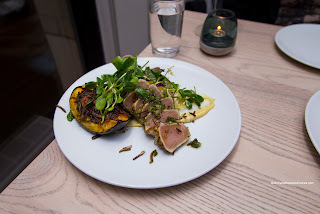 Also prepared expertly was the Albacore Tuna which was buttery and soft. I thought it was unevenly seasoned where some had more salt than other pieces. There was the crunch of the puffed wild rice as well as an herbaceous finish. When eaten with the tangy salad, there was a nice brightness to the flavours. I found the squash to be rather bland though. 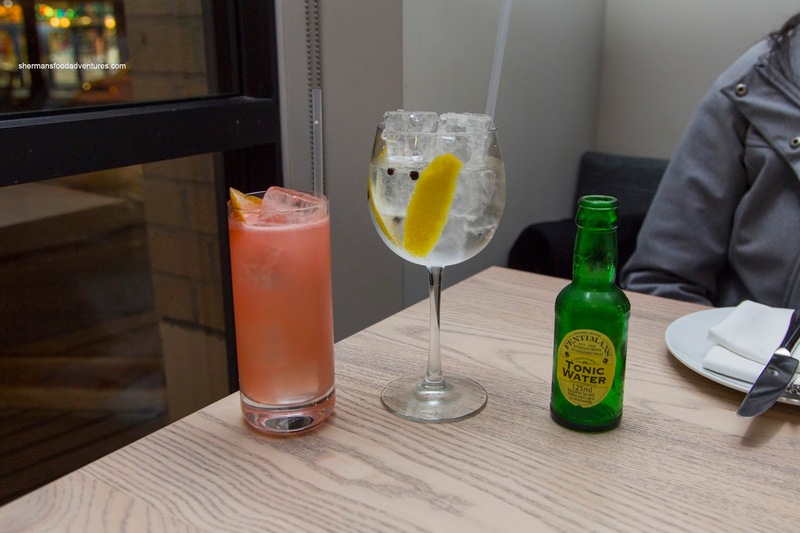 Although we only sampled 2 bevvies at Juniper, we will definitely try more in the future. As for the food, it was pretty good, but the drinks steal the show.